Jolly Gifts from Next-Gen Gaming and Side City studio is a Christmas gifts themed video slot machine, which explains the title. The new slot machine has 40 stake lines with five reels and plenty of features and winning chances. 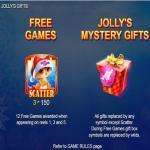 The main attraction of the slot is Jolly’s Mystery Gifts that can result in significant rewards. The slot machine also provides you with a free spins bonus round and wild re-spins. Jollys Gifts presents the Christmas theme with all of its joy and festivities through its excellent visuals and excellent sounds that will immerse you in a one of a kind experience. So do not waste any more time and try the slot machine here for free and see first-hand what it has to offer before you play it for real cash at any online casino. 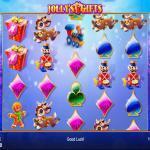 Jollys Gifts is a brand new slot by Side City Studio in co-operation with NextGen Gaming, which guarantees you a fun ride of the highest quality. The video slot machine has five reels with forty wager lines with a lot of winning opportunities, in addition to a great set of features and bonuses. So get ready for a Christmas ride that is full of gifts, both on screen and presents that will make their way into your pocket as you claim the massive payouts that the video slot machine has to offer. 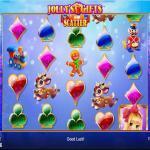 Jollys Gifts is a new slot machine that holds the combined power of Next-Gen Gaming and Side City Studios, which is not the first cooperation between the two. The result is always a mesmerizing and an engaging gaming experience, and this slot machine is not any different as it comes in great animations and visuals, a great theme and of course, plenty of bonus features and winning chances. The video slot machine has five reels with 40 lines. You can play the slot machine with bets that vary between 0.30 and 30 credits for each spin, on almost every single device out there. The Christmas gifts theme slot has five wild re-spins, mystery gifts, and up to twenty-four free spins. 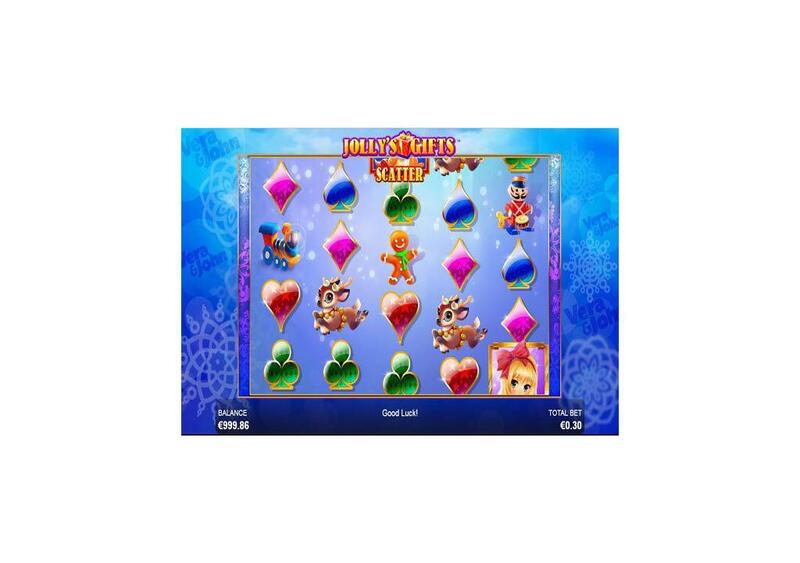 Visually, the video slot machine takes you into a Christmas theme through the visuals of the slot machine such as the snowflakes that will be moving across the screen, in addition to the Christmas jungle tune that is playing as you spin the reels of the game. You will see the gingerbread man, toy trains and reindeer toys and much more, in addition to the main character of the game, Jolly, the young girl who also represents the wild symbol of the game. There is also the scatter that can give huge payouts plus triggering the bonus feature of the slot machine. 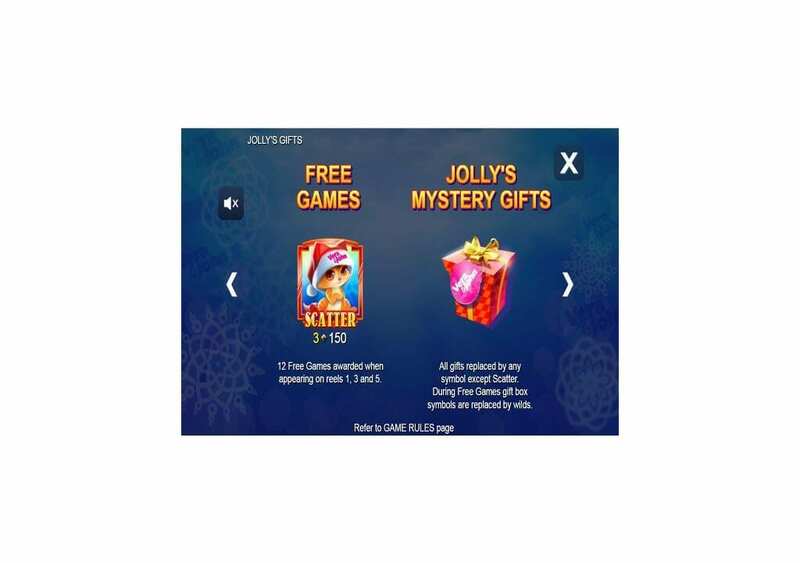 Jollys Gifts is a Next Gen Gaming/Side City Studio that celebrates Christmas, which is quite convenient since Christmas is less than a view weeks away. The slot machine does not focus on Santa, the reindeers and the elves like most Christmas slots, as it revolves around the toys and the gifts you get at Christmas, which explains the title of the game “Jollys Gifts.” The slot machine has toys and presents all over the reels in shape of symbols, and other things related to Christmas such as the gingerbread man and the snowflakes in the background of the Reels. 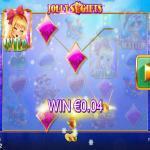 Jollys Gifts has a standard format that has five reels that have four rows of joyful symbols and a total of 40 wager lines that can result in massive rewards. All of the graphics of the slot machine are of the highest quality, with excellent animations that move in the background for an immersive ride. You will see a fancy blue pattern that is animated that is good to look at while enjoying the experience. 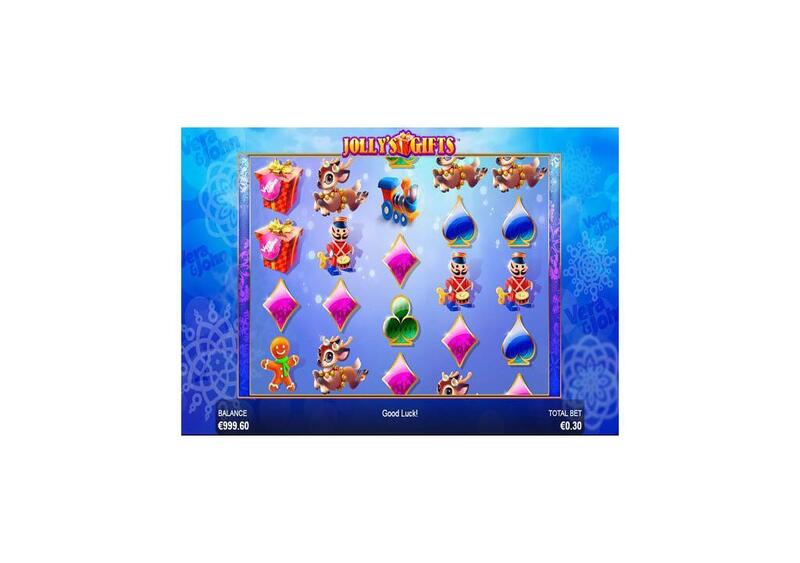 As for the symbols that are going to be spinning across the reels and the lines of the game, they include Jolly, the protagonist of the video slot machine, the cute little girl that has gifts and rewards for everybody. The other symbols include many Christmas gifts and toys; an adorable scatter cat, the gingerbread man, a toy train, diamonds, hearts, clubs, and spades. The visuals have a glamorous luster to them, which adds to the quality of the experience, in addition to the Christmas jingle tune that will play in the background that will further immerse you into the theme. 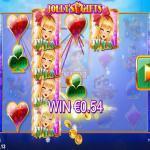 Jollys Gifts is a video slot machine that has a lot of winning chances, whether through the 40 lines or the bonus features. The slot machine has an RTP that is equal 95.71%, which is a medium-paying slot machine as many slots have an RTP of 97+. On the other hand, this does not mean that the game is not worth playing, as you can lure in massive awards through the lines of the game. For example, the slot machine has the highest payout that is equal 750. You can get that award when you get 5x of the Wild Jolly symbol on the same line. 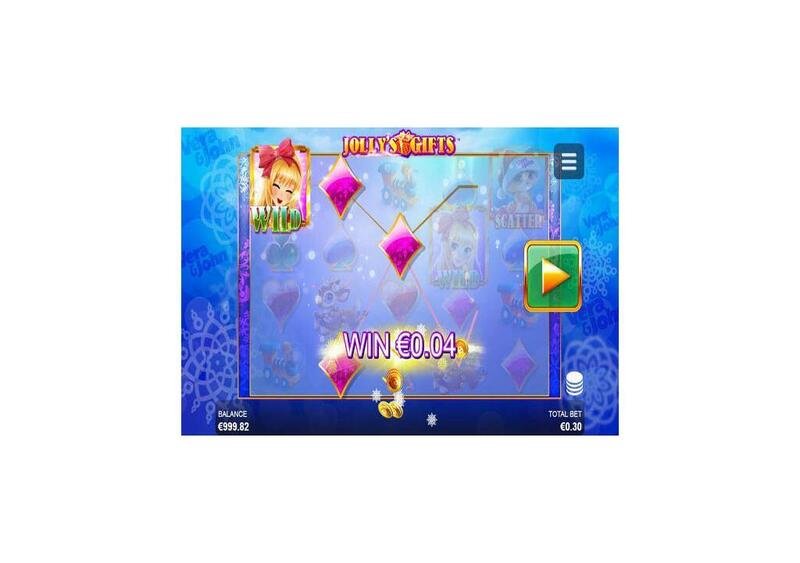 You can view all of the payouts of the video slot machine, in addition to the features of Jollys Gifts at the payouts table. 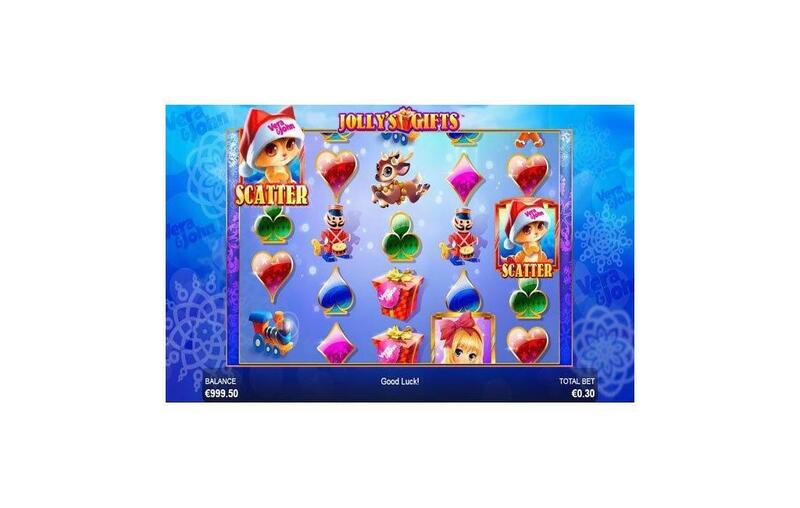 Jollys Gifts provides you with a multitude of features and bonuses that you will be able to take advantage of as you spin the reels. They include wild re-spins, free spins, a scatter and more. 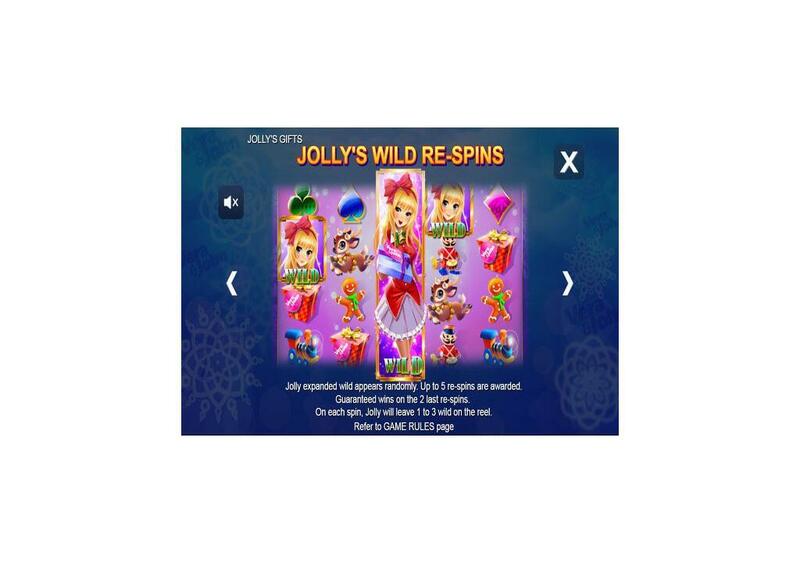 Jolly is the main character of the video slot, and that qualifies her to be the wild symbol of Jollys Gift, and she is going to replace all other icons that will be appearing anywhere on the reels to help you create the best payout, depending on the remaining symbols on the lines. The wild figure can also give you the highest line prize when you match it on a stake-line. Jolly expanded wild can become active randomly during the gameplay. The Wild will expand to cover the entire reel, causing re-spins. You can claim up to 5 re-spins. On each spin, jolly will turn from one to three reels wild.